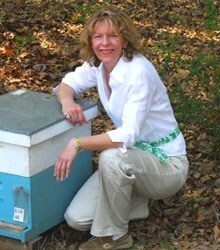 For over 18 years, Jennifer Berry's "full time" job has been the Research Professional and Lab Manager for the University of Georgia Honey Bee Program. Her research objectives have focused on queen breeding, improving honey bee health, the sub-lethal effects of pesticides on beneficial insects and IPM techniques for varroa and small hive beetle control. More recently, Jennifer has undertaken several ambitious campaigns to educate people from all walks of life. She volunteers in Central and South America to teach women and young teens the art of beekeeping so they may start businesses or enhance opportunities for better employment. Jennifer has also been instrumental in launching the Georgia Beekeeping Prison Program by certifying inmates through the University of Georgia Master Beekeeper Program. In three years, 8 prisons are now teaching beekeeping behind bars and over 80 inmates certified. She is also dutifully educating the public about the importance of pollinators and other beneficial insects and how to encourage their populations. Jennifer is a somewhat regular columnist for Bee Culture magazine and occasionally for other publications across the pond. She travels extensively to speak to local, state, national and international students, groups and beekeeping associations. On nights and weekends, Jennifer operates Honey Pond Farm, a honey bee venture which strives on rearing healthy bees and selecting queens for varroa tolerance, brood production, gentleness, and longevity. Twenty years ago a new chapter in my life was about to be written. I had stumbled into a beekeeping class taught by my soon to be major professor, Dr. Keith Delaplane. After the 1st class I knew honey bees would be in my life forever, and thank God they are. During my graduate years at UGA I focused my research on practical, applied ideas that had gained what we call “arm chair theory” status. Beekeepers believed in this or that but numerous ideas had never been challenged, experimentally that is. The first project I focused on was whether old comb had detrimental effects on overall colony health and production. There have been numerous other projects over the years that followed, especially after I was offered a full time research position at the UGA bee lab in 2000. Bees and beekeepers (commercial to backyard) face a whole host of issues today that just didn’t exist 30 years ago. One of the major reasons for this change is varroa. Because of this exotic, parasitic mite, Varroa destructor, honey bees have been on the brink of extinction for years now. Reason? Apis mellifera, (the European honey bee), has no natural defense mechanism or behavioral trait to combat varroa. Apis ceranae (Asian honey bee) is the natural host for varroa and hence the two have evolved over centuries and formed a host-parasite equilibrium. In other words, the Asian bees can tolerate varroa infestation but not our European race. In the early years, chemical treatments (miticides) were the only method known to control varroa. But over time, researchers and beekeepers have developed a whole host of different pest management strategies which have dramatically reduced or eliminated chemical use completely. This is good news since there is mounting evidence of sub-lethal effects on queens, drones and bees from the use of these very chemicals. Over the past decade more attention has been focused on integrating an array of pest management scenarios in order to reduce or eliminate the use of harsh chemicals. One such method is selecting stock with behavioral traits (grooming or hygienic behavior) that has proven to be beneficial in the bee’s ability to tolerate varroa infestation. Varroa mites are not going away, and hopefully bees won’t either. But as time marches on, bees are becoming more tolerant of mites and hence less reliant on chemicals for control. Jennifer has written numerous academic publications as well as articles for Bee Culture Magazine. A full list with pdfs can be found on the UGA's website.